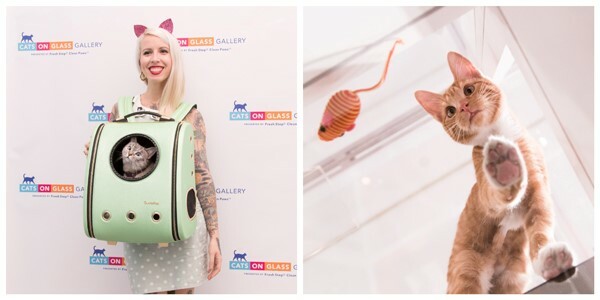 Los Angeles, CA (1/23/19)— The Cats on Glass Gallery, presented by Fresh Step® Clean Paws™, is an interactive pop-up with a purpose that gives cat lovers a one-of-a-kind experience in an effort to help more shelter cats find forever homes. The Gallery, opens its doors today for a limited time in downtown Los Angeles (1147 South Hope Street). LA feline fans can celebrate their love for cats while supporting a great cause. Curated by Fresh Step® Clean PawsTM to dramatize the benefits of the low-tracking litter, the exhibit features larger than life cat display, pom-pom room, me-owm meditation center, spcaLA adoption lounge and the feature exhibit: live Cats on Glass Playhouse that attracted waiting crowds in New York. All cats at the Cats on Glass gallery are available for adoption through spcaLA. Fresh Step is sponsoring cat adoption fees at the Downtown LA event, as well as spcaLA pet adoption centers. Guests are encouraged to come, snap and share their cat love throughout the gallery, where an Instagram post will trigger a litter donation to spcaLA. Participants will receive an exclusive cat-themed gift in return. More details will be available inside the #CatsOnGlass Gallery at the InstaShop. The public grand opening is January 17, 2019 from 7 – 9 p.m. featuring Hannah Shaw and LA native cat-lebrity, Nala Cat. The Cats on Glass Gallery will remain open January 18 – January 27, 2019 from 12 p.m. 8 p.m. and is located at 1147 Hope Street (near 12th Street) in downtown Los Angeles. Admission is free, but space is limited. A $10 donation fee to benefit spcaLA is suggested at the door. For more information, video footage, and to RSVP, visit www.CatsOnGlassGallery.com. For those not local or stuck in LA traffic, you can still take an inside look at the new Cats on Glass Gallery through a special Facebook Live interactive video tour with Fresh Step and surprise guests – famous felines and cat-loving influencers – on January 17, 2019 at 6 p.m. PT at Facebook.com/freshstep. You can also follow along on Instagram by following #CatsOnGlass @FreshStep.